When I first heard of the event, I was a bit taken aback. There’s an opportunity to participate in a wine judging panel among other consumers just as anxious to learn how to properly judge wines as me? As a publicist who is just breaking into the world of wine, with a special interest in Finger Lakes Wine, this was a great opportunity to gain more intimate knowledge of the wines of the region and learn from an esteemed panel including Peter Bell (Fox Run Vineyards), Lorraine Hems (Rochester Institute of Technology and The New York Wine and Culinary Center), Laura Kudla (MadderLake Cafe), Tim Moore (Imagine Moore Winery), Ann Raffetto (Wagner Vineyards), Lindsay Stevens (King Ferry Winery), Barry Tortolon (Rooster Hill Vineyards), Dave Whiting (Red Newt Cellars), Derek Wilber (White Springs Winery) and Jim Zimar (Prejean Winery). After mingling with fellow judges during a reception at the Rockwell Museum of Art on Friday night, Saturday morning began with a 2 1/2 hour training and judging session that included a Wine Judging “How To” session by Lorraine Hems, Wine Components Tasting by Peter Bell, Wine Flaws and “Off Flavors” demonstration by Derek Wilber (yes, we smelled hydrogen sulfide and cork taint during this one), Representative Wine Tasting by Jim Zimar and a Varietal Comparison Session by Dave Whiting for those who had participated in past Golden Nose Awards as judges. Okay, now we’re ready to get judging! 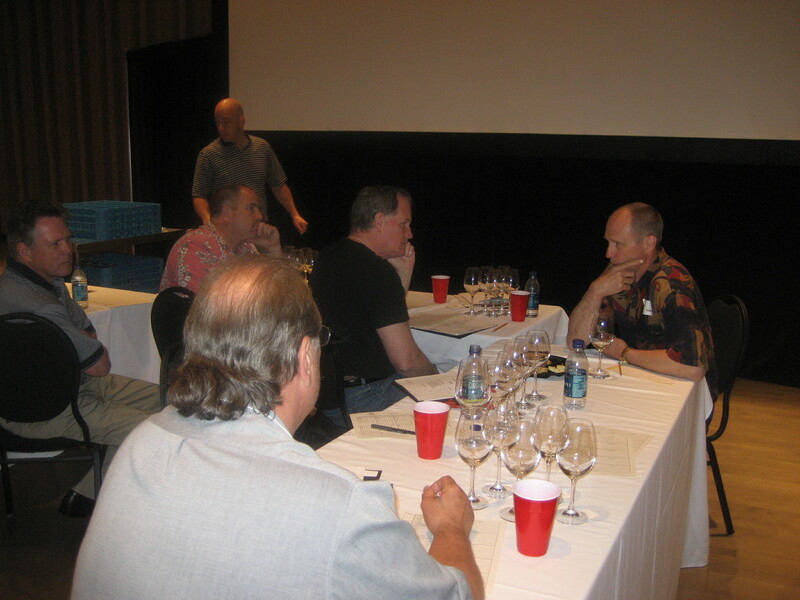 Judges were broken into smaller panels led by a panel leader who tabulated each wine flight’s scores. Each wine was judged and awarded points for Clarity, Color, Aroma, Taste, Balance and Overall Quality and given Double Gold, Gold, Silver, Bronze or No Award. A Double Gold indicated that the panel unanimously voted the wine a Gold Award winner. In our group, we only awarded one Double Gold. My panel judged wine flights of Sparkling Wines, Riesling, Pinot Gris/Grigio, White Hybrid Blends, Cabernet Sauvignon and Melomels (Mead w/fruit). I could see that the Golden Nose Awards judges were engrossed in the judging process and took it very seriously. Our panel was so fortunate to have one-on-one time with Jim Zimar, our panel leader, who was a wealth of information and anecdotes and gave us insight into a winemaker’s life. He grew up working during school breaks at wineries in the Finger Lakes, and became a winemaker at Prejean in 1986. I very much appreciated the time he took during our judging to explain winemaking process, growing conditions and his thoughts on how our emotional associations with certain smells can determine if we’ll like a wine since smell is such a large component of taste. The day concluded with the Dinner Reception, Grand Tasting and Awards Ceremony at the Corning Museum of Glass. The food was excellent and was prepared by CMoG’s Chef Christian Chiron. Attendees also had free reign of the wine tasting tables featuring the award winning wines of the day. The awards were presented by Morgen McLaughlin, President of The Finger Lakes Wine Country Tourism Marketing Association and Assemblyman Jim Bacalles, who was part of an Assembly Minority that secured funding for the New York Wine and Grape Foundation and for the Farm Viability Institute. Local favorite Virgil Cain performed for the “hard-working” judges, their guests and dinner attendees. Congratulations to the winning wineries!